The routine response to 17 vials of blood taken to check, maintain, and sustain still makes a parent weak. We leave the National Institute of Health Sciences feeling tired and breathing a few sighs of relief. Two full days of testing, talking, and questions is tough to endure. 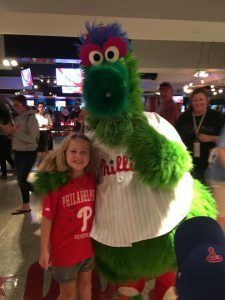 The entire visit was kept exciting because, “I am going to meet the Phillie Phanatic,” Kelsey told anyone who would listen. 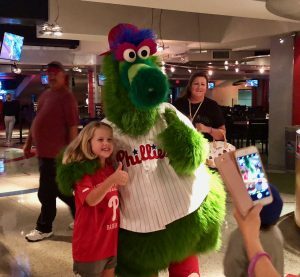 Jake Arrieta of the Philadelphia Phillies had impeccable timing to offer his suite for a charitable night for Kelsey’s Kaleidoscope, Inc. All day long, sporting her Phillies shirt and hat, Kelsey remained positive and focused on the game and a chance to meet the Phillie Phanatic. Thank you to the Arrieta family and our generous donors for making the evening full of fun. Though they did not win the game, we came home positive and grateful after a long two days. Each Tuesday night is unique. The worry is constant and fear, worry, and sometimes anger are typical discussion points for most of the evening. Tuesday evening was no different this week. The marks all over the belly and the back were. After a nice walk around a park and calming conversation, we thought our bedtime ritual would contain the easing of fears and the notion of sweet dreams ahead. Instead, photos were taken, prayers were issued, and we are once again reminded of the mixed emotions we know the morning will bring. The thunder outside echoes our inner fury and angst. We hope the rain relieves the heat and our morning medication subsides our worry for another day. Wednesday Addams… a classic television character was the recent choice of a party we were invited to with an Addams Family Theme. 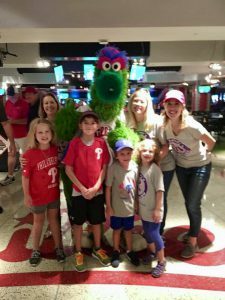 Wednesday, “the dreaded day” seemed fitting in many ways for Kelsey. The mention of the weekday sends a jolt of fear and frustration to Kelsey each week. We were surprised that she decided to dress the part, but being Wednesday “the worst day of the week” on Saturday made her smile. Kelsey said that this was the first and probably last Wednesday she would enjoy talking about. Wednesday on Wednesday does not have the same sentiment, but at least she found a way to smile for Wednesday (on Saturday).